Smart Local Governance meeting "The challenge of good governance in local administrations"
The Committee, in collaboration with UN-HABITAT, the Committee on Decentralization and Local Self-Government and the LSE Cities Programme, is organizing the upcoming working meeting that will focus on “Smart Local Governance: the challenge of good governance in local administrations”. The Smart Local Governance includes political and active participation, citizen services as well as the smart functioning of the administration. All of this with the support of new technologies, which enable the introduction of a new relationship between Local Governments and citizens; in particular regarding the introduction of public on-line services and the use of New Technologies to improve the participation of citizens in public decision-making. 1. 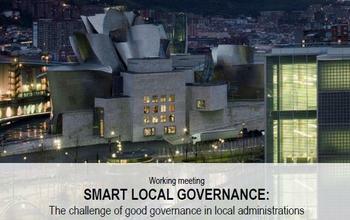 Strategic local public management: Challenges and keys to success.